Images may differ from original. 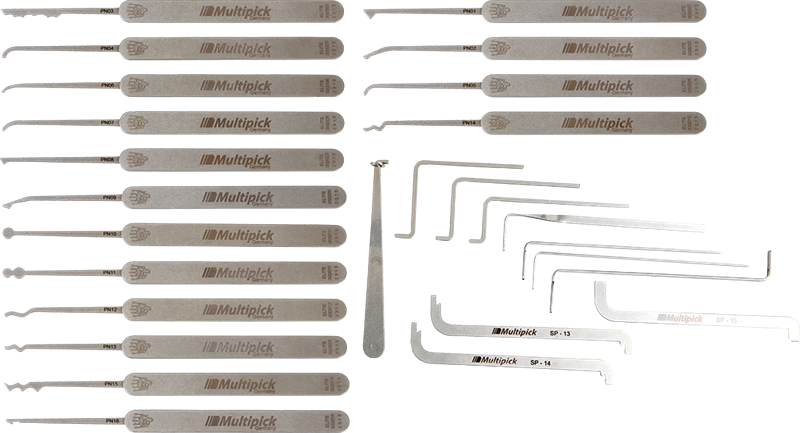 Multipick ELITE Super-Pick Set 37 pieces. Presently the largest Multipick lock pick kit with 26 high-quality picks and 11 tension wrenches packed in a genuine leather roll-up sleeve. In this kit you get everything what a professional needs to open locks. With that being said, you’re perfectly equipped to face any challenge. Now including the new TOK tensioners SP-13, SP-14 and SP-15 for better picking! 26 ELITE Picks and 11 Tension wrenches are waiting to be put into operation. An excellent set which really deserves its name. 100% Made in Germany - by Multipick, of course. In addition to the 16 different ELITE picks, there are now 10 different ELITE Bogota picks. 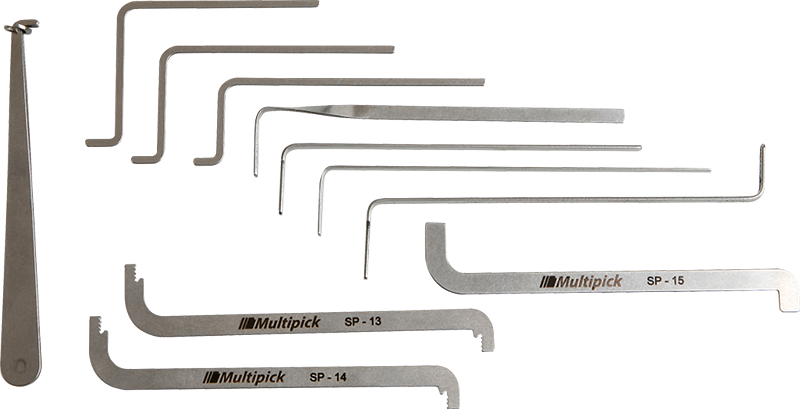 With this we give all Bogota pick-lovers, beginners and advanced lock pickers to rake several pins at the same time. Further, padlocks and profile cylinders can be opened as well. This extraordinary kit for professionals comes in a handy genuine soft leather roll-up case. Don't just take our word for it - check it out for yourself! Our Elite picks will not rust because they have been quenched and tempered by a special process. 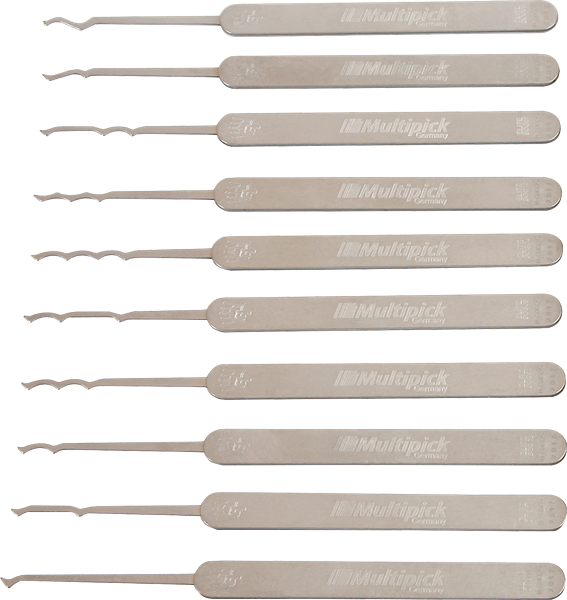 Good variety of lock and bogota picks, excellent quality and a great value. Awesome set and a great review by Bill. Thanks for the quick delivery. 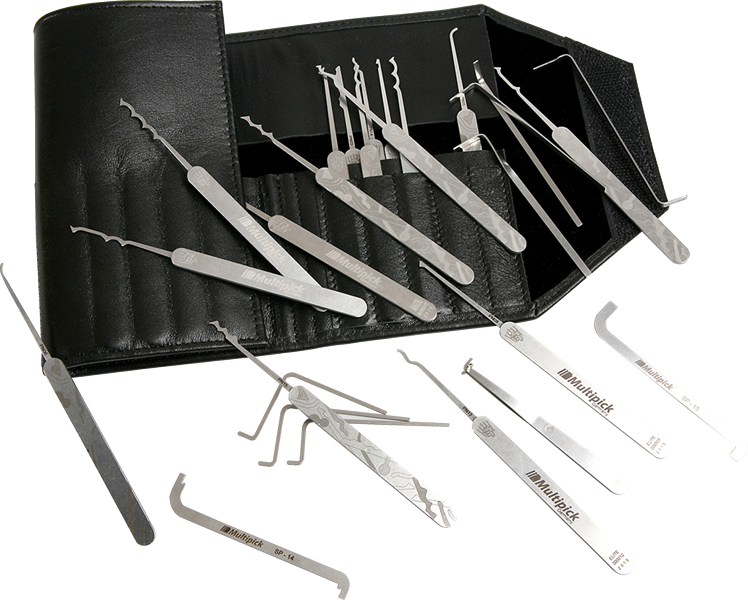 Kit has a large variety of wafer picks and rakes for various models of locks. Considering the wide selection of available tools, the price is pretty reasonable compared to other pick sets. The picks are very sturdy, has a smooth finish and provide an excellent feedback. The case that comes with it holds everything perfectly and is great quality. Good stuff! I own many lock picks of various design and brands, but these are the best I’ve ever found. Excellently constructed and has almost everything you need to pick or rake. If you have any picking skills you'll love these. Thanks for the prompt delivery. Absolutely brilliant. It has just about everything you need to get you started. Contains the most commonly used picks and bogota rakes in a well made leather case. I recommend this kit for both beginners and the more experienced lock-picker, great value! Excellent, well made, strong lock pick set. These are of the finest design and very well constructed. 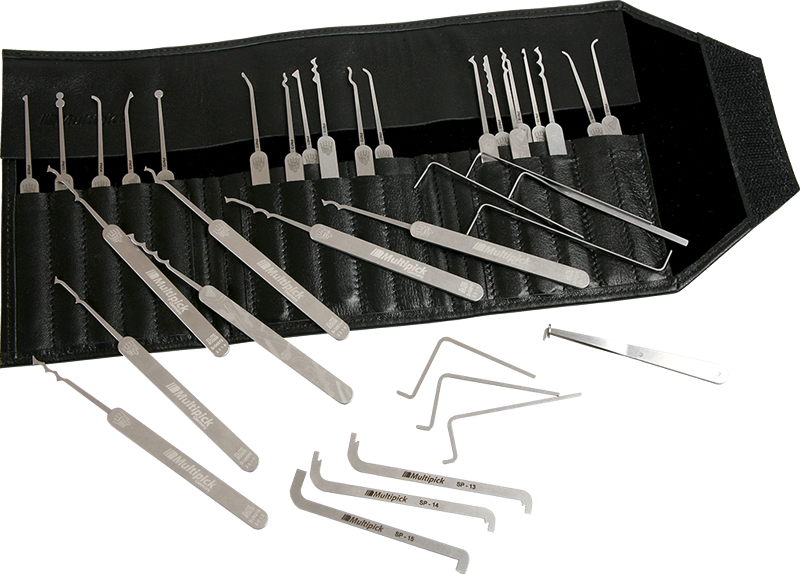 When I tried these picks and rakes I managed to open every lock I own in a few minutes and I believe this kit will serve for a very long time. I highly recommend these tools and thanks again for all the help.